“Speaking with you this morning has particular significance for me. Thirty years ago, as a sophomore in high school in Baltimore, Maryland I had the opportunity to be part of the Student Planning Committee of a Youth Leadership Conference sponsored by the American Friends Service Committee - a Quaker organization devoted to vast issues of social justice, locally and globally. For the conference we developed workshops on: the Selective Service and the Draft; Homelessness; Racial Inequality; Militarization; Protest Thought; Grassroots Organizing; Social Activism - and more. As such, I feel particularly comfortable in this space, with you all, and the work before us today. “Given our collective experience here, as members of the Montessori community, I wanted to speak to you briefly about Dr. Maria Montessori and her role as a Scientist, Child Advocate, and Peace Activist. “Dr. Montessori was a keen observer. She believed that humans were predisposed to interacting with their natural environment. In fact, she saw in her first students a deep, intrinsic need to explore & experiment. Dr. Montessori knew that the traditional factory model of education wasn’t going to allow for such self-direction, such freedom. It had to be different. Providing children unique freedom within the limits of a prepared environment that spoke to the senses as well as the intellect wasn’t just a cool thing to do… It was everything, the main driver and shaper of the child’s experience. and, she saw how the children - very young men - of Europe were being prepared for the fields of battle. “Her work, then, became one of not only advocating for the developmental needs of children as they grew, but also of helping others to see the child as the future - the “bright new hope for [human]kind”. Throughout her life Dr. Montessori lectured tirelessly on rethinking what childhood should/could be. “This way of thinking, and the model of education that she designed in service of that paradigm, was very successful. People started to take notice, including Mussolini - the italian dictator. As the seeds of hatred and intolerance began to take root at the dawn World War II, Dr. Montessori shuttered her clasrooms and fled Italy because of her antifascist views. She was sponsored to take refuge in India, where she continued to study. It was in India that she developed the concept of Cosmic Education - the intimate linking of all things, and that of one’s Cosmic Task - one’s particular role in it all, that we each play a critical part in our collective survival. “For this work, as a Scientist, Child Advocate and Peace Activist Dr. Montessori was nominated for the Nobel Peace Prize three times - in 1949, 1950, and 1951 - but never won. “As students here at Compass Montessori School, you are the heirs of Dr. Montessori’s vision, the recipients and beneficiaries of her legacy. We all are. Our job, then, is to continue her call to action, to carry the torch forward. “The issues of today are no less significant than in Dr. Montessori’s age: Gender Inequality; Income Inequality; Police Brutality; a Biased Judicial System; for many students in our country, a School to Prison Pipeline; Challenges to the Voting Rights Act of 1965; Endangerment of the World’s RIch & Varied Ecosystems; Immigration Reform; LGBTQ+ Issues; Global Militarization & War Mongering; a Mass Media that Spins Information as it Wishes; Campaign Finance Reform… This, a partial list, and in no particular order. “So. Within the scope of our collective Montessori experience: What do we do? How do we move forward? This morning, I offer you fifteen aphorisms to charge your batteries. The powers that be might seem, at times, unstoppable. Remember the words of Radio Raheem from Spike Lee’s Do the Right Thing… : “Let me tell you the story of Right Hand, Left Hand. It's a tale of good and evil [Love vs. Hate]... The story of life is this: static. One hand is always fighting the other hand... I mean, it looks like the right hand, Love, is finished. But hold on, stop the presses, the right hand is coming back…” Just when you think Hate is going to overpower what is good, Love survives. Make no mistake. You are the critical difference. Despite an overly active intellect, and an ego that - at times - may need restraint, and an awareness of oneself that is unparalleled when compared to other mammals…We are only protoplasm after all, held together with facia and sinew and propelled by a miasma of electrical impulses. For heaven’s sake, breathe in and breathe out... We all will be the better for it: Our Bodies, and Our Causes. Do the right thing. You’ll know it’s right because you’ll FEEL it. Or, more likely in the beginning, you’ll feel that what you did wasn’t right and you will vow never to do that again. Who you are and what you do is LOVE made manifest. Let your freak flag fly. We are all hurting. All of us. To help people you have to know people. Take the time to be, in the words of Bryan Stevenson, “proximate”. No one does what you do better. Nothing Changes if Nothing Changes. Put Yourself ‘Out There’. Deny the gravitational pull of waiting to see what might happen if… Get in there. Get Scrappy. And, act like you mean it. It is an active sport! ( And by the way: Vote. And Vote smart. Don’t for a second believe that by not voting you are ‘sticking it to the man’ - for he’s not paying attention - or by writing in your favorite candidate you are taking a stand. Those are the actions of the entitled and privileged, my friends. Do something that will actually make a difference in somebody’s life). “You. You are the answer our world needs. Right Now. The world will be what you dream it to be. Complete that dream with dedicated and tireless action. There is nobody better suited to that work now than you. (Image Sources: 1. 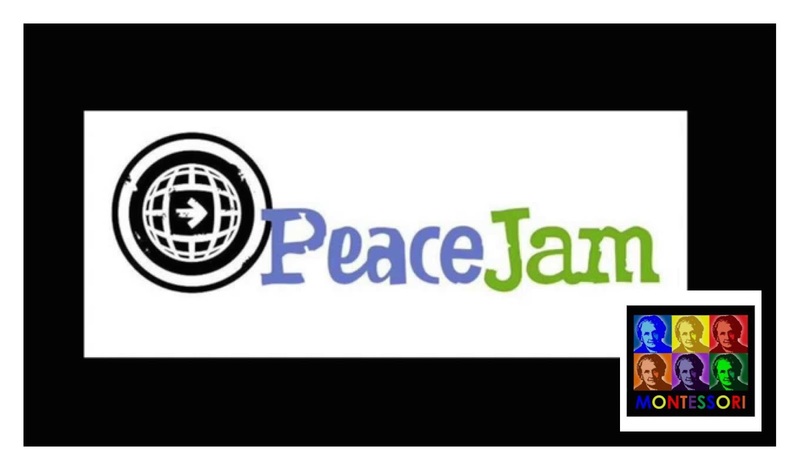 PeaceJam Logo: www.peacejam.org; 2. "Warhol on Montessori" at www.cafepress.com).